The Betting-Book. By George Cruikshank. With Cuts. London: W. & F. G. Cash, 5, Bishopsgate Street Without; [successors to Charles Gilpin.] 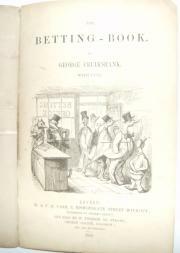 And sold by W. Tweedie, 337, Strand; George Gallie, Glasgow; and all booksellers. 1852. 8vo: 32 pp. Stitched. In original grey wraps. Text, four illustrations and map clear and entire. Printed on discoloured high-acidity paper. Lightly creased with a little wear to corners. Scarce. 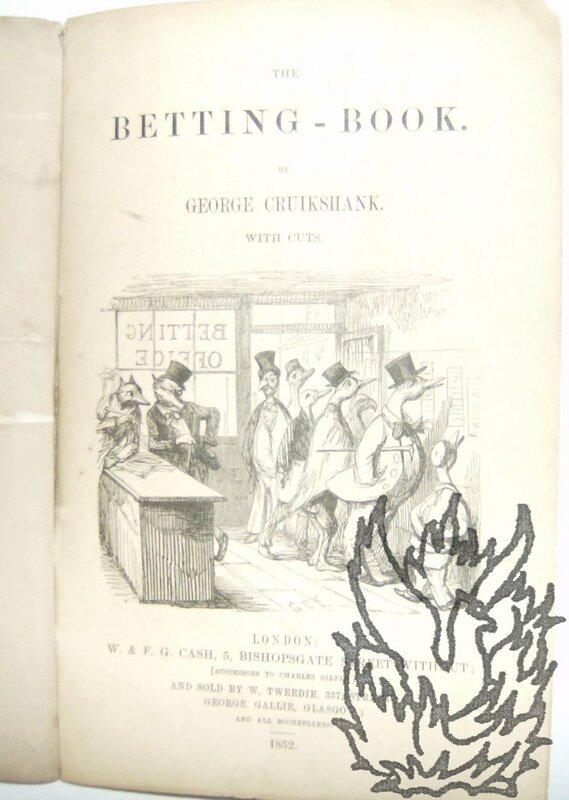 An attack on 'the Betting-offices that are springing up all over the town', with particular reference to those in the St Martin's Lane area. COPAC only lists four copies: at the British Library, Bodleian, Cambridge and Edinburgh; with two copies of the second edition: British Library and V & A National Art Library. Autograph Letter Signed to S[amuel]. Redgrave. Kent House | 4 April' [no year]. Author and politician (1806-63). The recipient (1802-76) was author of a dictionary of English artists, and successively private secretary to several English statesman. Two pages, 12mo. An odd request. 'I have been asked by a friend to ascertain for him whether any person has ever been tried in England for suffocating a human being supposed to be affected by hydrophobia. If you shd. be in possession of any information which throws light upon the subject, would you have the kindness to enable me to answer the question'. signed 'G C Lewis'.